It's no secret that both Ferrari and Renault have failed to live upto the benchmark set by Mercedes with the 2014 poweruint. As always that doesn't stop manufacturers trying to make up ground though, with both Ferrari and Renault making strides since the start of the season. Fuel has provided the platform for large performance gains in both cases, with new blends being used to facilitate better power and performance as the teams look to extract more from their race allocation of fuel. This is an area that Mercedes and Petronas bested their adversaries with before the season commenced and so perhaps have less to gain as the season continues. Marussia tested (at the post Silverstone test) with their exhaust primaries wrapped, to see what sort of performance gains could be made. It's something that the other teams have been doing since the start of the season and so it has been one of those head scratchers as to why Ferrari hadn't adopted it before now. Questions were raised after the Marussia test as to the legality of the Ferrari teams deciding to wrap their exhausts mid season, owing to the homologation regulations. I've been stead fast in my opinion since then that this practice is legal as they're not changing the specification of exhaust simply heat wrapping it. Of course there are compound effects of heat wrapping an exhaust, as it will increase the exhaust gasses potential velocity. This increase in exhaust gas velocity increases the turbochargers potential which in turn increase the MGU-H's potential to harvest energy, passing it either directly to the MGU-K for instantaneous power or to the ES (Energy Store) for later deployment. The increased temperature and velocity of the exhaust gases driving the turbine will of course change the requirements of the fuel being injected into the cylinders, producing more power. This development will undoubtedly have implications for Shell, as temperature (especially EGT, Exhaust Gas Temperature) will play a crucial role in their fuels development, giving them another opportunity to make incremental gains. 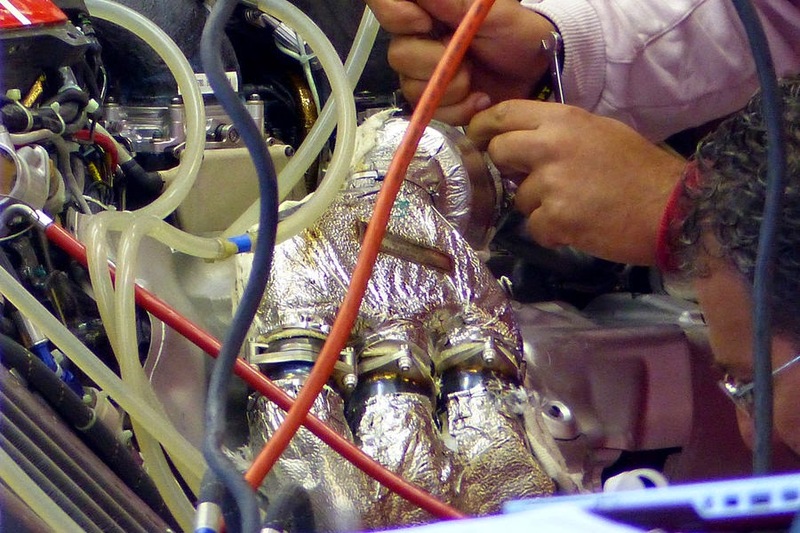 As we can see from the images above, Ferrari have 'bagged' their manifolds rather than using exhaust wrap, this will have a slightly different effect and of course comes with a slightly higher cost. It's difficult to proportion a power figure to this heat enclosure method as I've seen 20bhp banded around on other sites. I'd be weary of giving actual figures and ask that people not only look at the additional top end performance that it achieves but the compound effects we see with fuel, ERS etc. Would the increased velocity of the turbo, created as you said by the increased temperatures, require better intercooler capabilities for the compressed air on the other side of the turbo? Maybe Ferrari was on the limit with their intercooler until now? No problem, of course one compounds the other however it may have been that the team were below target (in terms of the boost being generated) and so the intercooler (chargecooler in Ferrari's case) may have had a performance buffer left over. 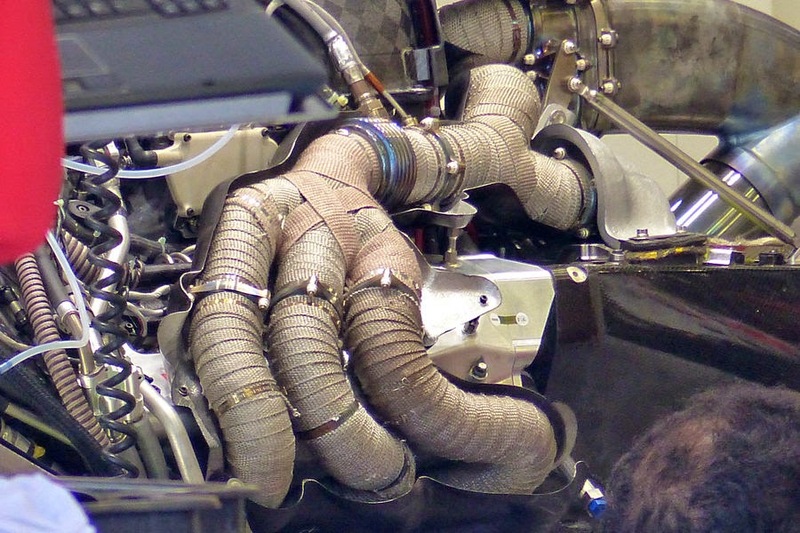 Is there any reason F1 teams could/would not run the exhaust out of the inside of the V besides maybe cooling? I know it is more complicated than just moving it but I'm curious. Firstly Ferrari's V is occupied by the chargecooler and MGU-H, however the regulations prohibit the placement of the exhaust anywhere but on the outside of the V in any case. Thank you vary much for answering my question. Apart from the the gains in engine / drive-train power, what are the advantages in decreased temperature build-up under the engine cover? 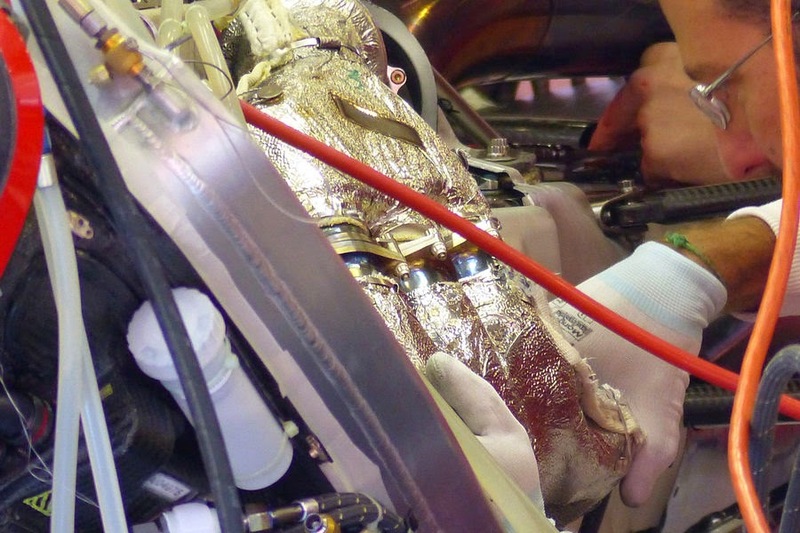 Will we see slimmer engine covers, smaller air exits etc.? Will we see significant performance gains because of that? Ferrari already have a plethora of options when it comes to cooling outlets/bodywork with their current slimmest one likely to be the slimmest they use. The mere fact that they've wrapped the exhaust means they're continuing to push performance and that will likely come at the cost of a similar heat offset anyway.